Be the first to share your favorite memory, photo or story of Maribel. This memorial page is dedicated for family, friends and future generations to celebrate the life of their loved one. Forever in our Hearts. 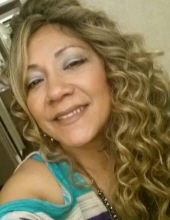 Maribel Castellanos, 55, of Wheatland, CA, resident of almost 17 years, entered into rest on 24 December 2018. Maribel was born in Mexico City, Mexico, to Jose Rufujio Torres and Alicia Anglada Torres on 1 November 1963. Maribel is survived by her children: Eddie Torres; Ray Castellanos Jr; Monica Castellanos; Mario Castellanos; grandchildren: Alexia Torres; Elexsani Torres; husband, Ray Castellanos; and 8 siblings; 3 brothers; and 5 sisters. Forever to be remembered by all in which she encountered. Maribel was a loving mother, grandmother, wife, sister, and true friend. A heart of pure gold, she was genuine and compassionate, empathetic and brave, courageous and loyal, creative and bold, radiant and full of life. A true child of God. Family, Friends, and others whose lives Maribel has touched are all invited to the Lakeside Colonial Chapel, 17 January 2018, at 11:00 am, with Pastor Richard Braxton of Calvary Christian Center to reminisce, grieve, pray, and celebrate the beautiful life of Maribel Castellanos as she returns home to Christ. To send flowers or a remembrance gift to the family of Maribel Castellanos, please visit our Tribute Store. "Email Address" would like to share the life celebration of Maribel Castellanos. Click on the "link" to go to share a favorite memory or leave a condolence message for the family.